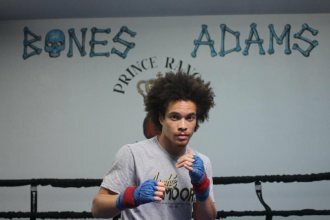 LAS VEGAS, NV (March 19, 2019) - undefeated welterweight prospect, Blair "The Flair" Cobbs (9-0-1 6KOs), who is managed by Prince Ranch Boxing's Greg Hannley and Promoted by Golden Boy Promotions, will square off against unbeaten prospect, Ferdinand Kerobyan (11-0 6 KOs) in an eight-round bout for the Junior NABF Welterweight Title. The eight-round bout will be the co-main event to the 10-round fight between Filipino lightweight contender Mercito "No Mercy" Gesta (32-2-2, 17 KOs) and Mexican warrior Juan Antonio "El Mozo" Rodriguez (29-7, 25 KOs), initiating the new Golden Boy DAZN Thursday Night Fights series. The event will be streamed live only on RingTV.com stream beginning at 4:30 p.m. PT/7:30 p.m. ET. Here is what Blair Cobbs had to say about his upcoming fight with Kerobyan. "This is going to be a great fight between two undefeated fighters. He's very aggressive and throws a lot of punches. I'm coming into his backyard where he's fought many times. I feel I'm the superior boxer and I'm going to prove that I'm the better man when we step in the ring. I know he was a decorated amateur and he'll be the best fighter on my résumé, but I'm confident in myself, my will to win will be the key to victory." "Training camp has been great. The work I've been getting has been with some of the top fighters in Las Vegas. Right now, I'm in the best shape of my life as my strength and conditioning has been tremendous. My team and I have a game plan we feel will work against an aggressive fighter like Kerobyan." "This is a monumental fight for my career. A victory will open up many doors for me to land some big fights with all the top guys in the welterweight division. Winning the Junior NABF title will be the first step toward getting ranked, and one step closer toward getting a world title shot. I'm excited for the opportunity and I'll be ready to bring the heat on fight night." "Fighting as the co-main event on this new series is the kind of opportunity that I've been seeking since singing with Golden Boy. I'm looking forward to putting on a great show for all the fans that will be tuning in. Everyone watching will see a hungry fighter in myself, one who is going to leave everything in the ring."